Tall, enthusiastic and vigorous, Bill Milroy hailed from Terang in western Victoria, and was playing strong football at Flinders Navy Base in 1950 when he was recruited by North Melbourne. He managed six senior matches in his first year, and another early in 1951, but Bill never really settled in at Arden Street, and his decision to request a clearance to Carlton proved to be the right one. 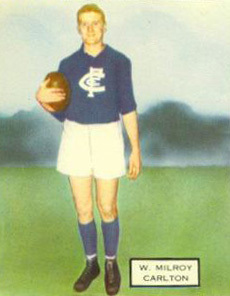 With the Blues, Milroy clocked up 90 matches and an even 50 goals in the better part of six seasons between 1951 and ’56. At his best as a knock ruckman, his aerial ability also made him a more than handy pinch-hitting forward - as he proved with an outstanding game at centre half-forward in Carlton’s 1951 Reserves Premiership victory over Essendon. Sadly, Bill’s only final at senior level for the Blues came in 1952, when Carlton met Fitzroy in the 1952 first Semi Final, and lost by one point - despite having nine more scoring shots. Carlton made the finals that year predominantly because of a powerful ruck division of Ken Hands, ‘Mulga’ Davies and Milroy, all of whom were capable and effective at centre half-forward as well. Bill wore guernsey 29 in 1951, then switched to number 2 for the remainder of his career. He was a popular Best and Fairest winner in 1954, then served as vice-captain to Ken Hands in 1955 before retiring at the end of the following year. Two decades later, Bill’s son Gary Milroy represented Carlton at Under 19 and Reserves level from 1974 to ‘77, like his father, Gary wore guernsey number 2 in his last season. Aged 62, William Wallace Milroy passed away on the 21st June, 1992. Contributors to this page: Bombasheldon , pblue , PatsFitztrick , tmd1 , molsey , p(12)terg , Jarusa , true_blue24 and admin . Page last modified on Tuesday 07 of May, 2013 21:01:12 AEST by Bombasheldon. 1982 - VFL Veterans still hold their form (22/05/82).